Microsoft did so, Sony did so, and now Nintendo? Price cuts have been the major story in the month of August for 2 of the 3 console makes, with Sony striking first with their announcement (coinciding with revealing the PS3 Slim) and then Microsoft came in with the counter with their price cuts on there Elite models. 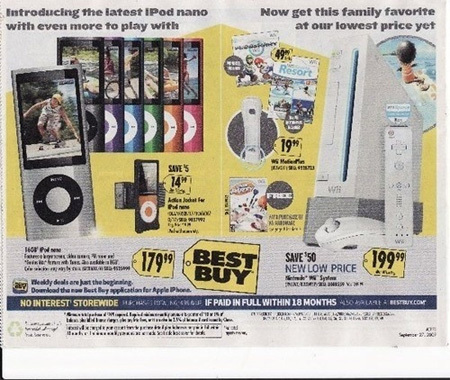 Now it looks like Nintendo will also make prices cuts for the Wii according an indirect source: the retailers. Pretty definitive for a rumor. If you don’t trust the indirect rumor, try the direct rumors: Nintendo themselves. According to Nintendojo, a conference call between Nintendo and the retailers took place and confirmed that a price cut to $199 was to be effective as of Sunday, September 27th. You are wondering why Nintendo would be hush-hush about this sort of big announcement, and not announce it now since the cat is (probably) out of the bag. Well, it may be possible that Nintendo is waiting until the Tokyo Game Show this week to announce it officially of the price drops. It was virtually the same situation from Sony: price drops were imminent, and they announced it at a big gaming expo (Gamescom). We’ll, in the gaming business, sometimes the greatest news is the worst kept secret. This entry was posted	on Monday, September 21st, 2009 at 10:30 AM	and is filed under Games. You can follow any responses to this entry through the RSS 2.0 feed. You can leave a response, or trackback from your own site.